Take a trip from Madrid to Aranjuez and discover the beauty of this royal city, which has been designated a World Heritage Cultural Landscape. Your knowledgeable guide will show you the Palacio Real, Aranjuez’s most famous landmark. 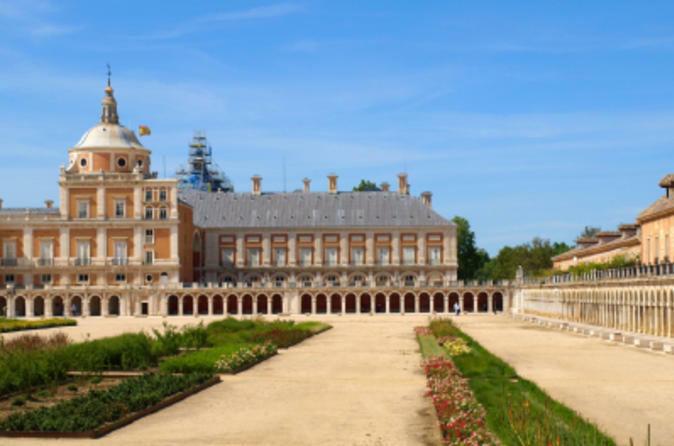 On this half-day tour from Madrid, enjoy the beautiful architecture and regal atmosphere of Aranjuez, which lies 28 miles (46km) south of Madrid at the confluence of the Tagus and Jarama rivers. Your local guide will lead you the Palacio Real (Royal Palace), part of Aranjuez’s UNESCO World Heritage Cultural Landscape. It is a Spanish Royal Site – the spring residence of Spanish kings since the late 1800s. Admire the decorative styles, and see the Throne Room of Elizabeth II, the Prince's Gardens, the Parterre and the Island. The palace gardens are so beautiful, they inspired Spanish composer Joaquin Rodrigo to compose his Concierto de Aranjuez.